The malt from the Knockdhu distillery was originally re-named an Cnoc in 1993 to avoid confusion with Knockando, but the name only took hold after new owners Inver House, who bought the distillery in 2001, had relaunched the an Cnoc brand in 2003. Today, thanks to some top-quality work by Inver House, the previously staid-looking packaging of the old Knockdhu is a distant memory and an Cnoc is one of the most dynamic and exciting malt whiskies around with new releases and core range bottlings receiving praise from across the industry. 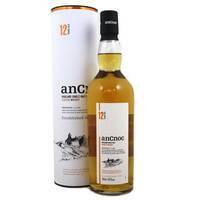 Summary: (Pronounced – a-nock), anCnoc 12 Years Old is renowned the world over, a must have in any whisky drinkers collection. It's light, yet complex, it's smooth yet challenging, each twist and turn delivers a surprise. For malt drinkers and new to malt alike, this is a dram that has something for everyone. Nose – Soft, very aromatic with a hint of honey and lemon in the foreground. 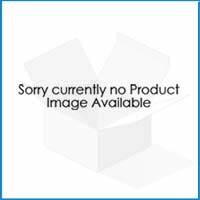 Colour – Amber with a slight yellow hue. Taste – Sweet to start with an appetising fruitiness and a long smooth finish. A malt for every occasion. Summary: Nose – Soft, very aromatic with a hint of honey and lemon in the foreground. Colour – Amber with a slight yellow hue. Taste – Sweet to start with an appetising fruitiness and a long smooth finish. A malt for every occasion. Pronounced – A-nock – Whisky Region – Highland Whisky region of Scotland – Distilled, Matured and Bottled in Scotland by the Knockdhu Distillery Company, Aberdeenshire. 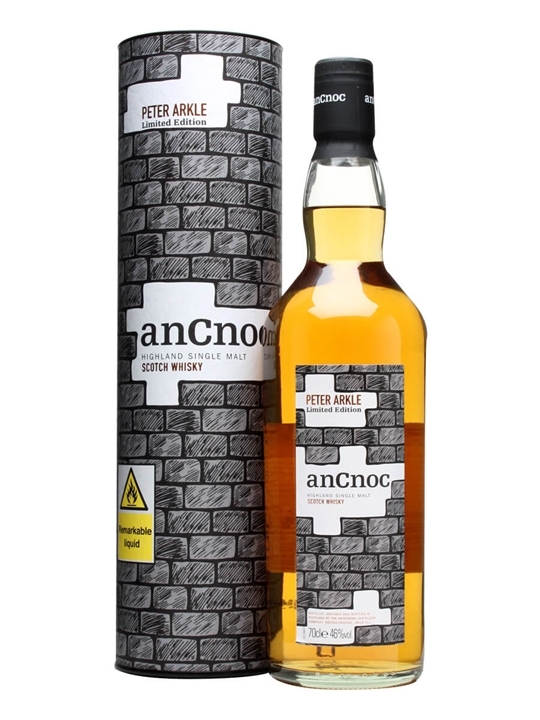 Summary: 70cl / 40% / Distillery Bottling – This lip-smacking 12yo AnCnoc (formerly Knockdhu) is a top-quality proponent of the non-sherried Speyside style, showing polished malt and a delicious spiciness throughout a warm, complex palate and lasting finish. Summary: This whisky is 35 Years Old. Summary: Throughout the Scottish uplands, most extensively in the north and west, you will find the heart of the peatlands. Remote and isolated yet rich in iconic wildlife, this environment rules the landscape and provides a valuable fuel for the whisky-making process. Knockdhu Distillery, established in 1894, is one of the most enchanting in the Scottish Highlands. Bounded by an abundance of natural resources wonderfully suited to whisky making, the distillery lies in the shadow of nearby Knock Hill – home to springs of pure, clear water – and sits on the doorstep of a region rich in barley and peat. A natural resource, peat was historically embraced as fuel to fire the still and dry the barley for the distillation of whisky. It is traditionally cut by hand using several traditional cutting tools. Peatiness can be controlled by the amount of peat burnt and the humidity of the barley. Peat smoke produces chemicals called phenols and it is by its phenol content that a whiskys peatiness can be measured. This phenol content is expressed as PPM (parts per million) and to ensure consistency, Peatheart uses barley, specified by their Master Blender, malted to 40PPM. Tasting notes… Colour: Pale amber Nose: An initial smoky burst surrenders to a surge of fruitiness. Ripe pears and the citrus notes of apples and limes with just a touch of tobacco in the background. The nose is balanced yet an undeniable smoky sweetness prevails. Taste: Smoke laced with leather and sweet stewed apples. Chocolate is there too, perfectly complemented by sweet vanilla and zesty lemon. The finish has a lingering warmth with a floral smokiness. From Knockdhu Distillery. 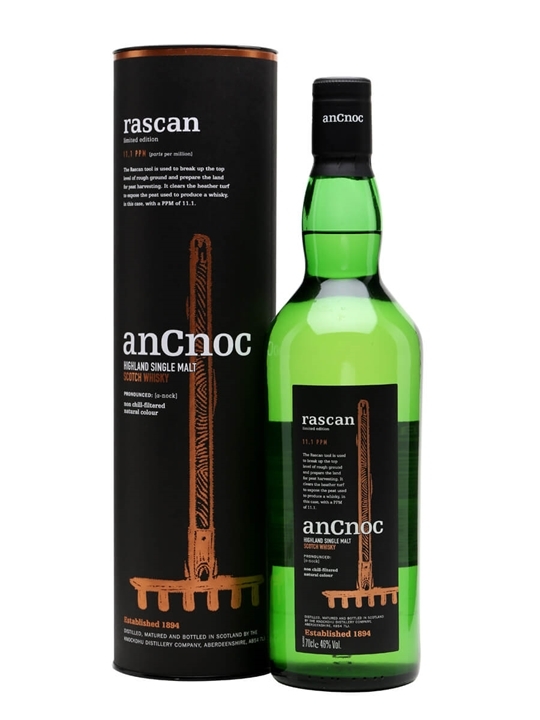 Summary: A limited edition anCnoc called rascan. The Rascan tool is used to break up the top level of rough ground to prepare the land for peat harvesting. It clears the heather turf to expose the peat used to produce a whisky in this case, with a PPM of 11.1. Tasting Notes – Colour – Muted gold in appearance. 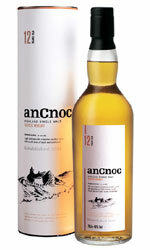 Nose – An initial honey sweetness followed by green apples and the accents of oranges and lemons so typical of anCnoc. Tatse – Sweet and spicy notes of vanilla and honey are carried forward at the first sip. Hints of toffee then push through outlined by subtle spices and a smooth leathery undertone. The finish is floral yet pleasantly smoky. From Knockdhu Distillery. NOSE: An initial smoky burst surrenders to a surge of fruitiness. Ripe pears and the citrus notes of apples and limes with just a touch of tobacco in the background. The nose is balanced yet an undeniable smoky sweetness prevails. TASTE: Smoke laced with leather and sweet stewed apples. Chocolate is there too, perfectly complemented by sweet vanilla and zesty lemon. The finish has a lingering warmth with a floral smokiness. 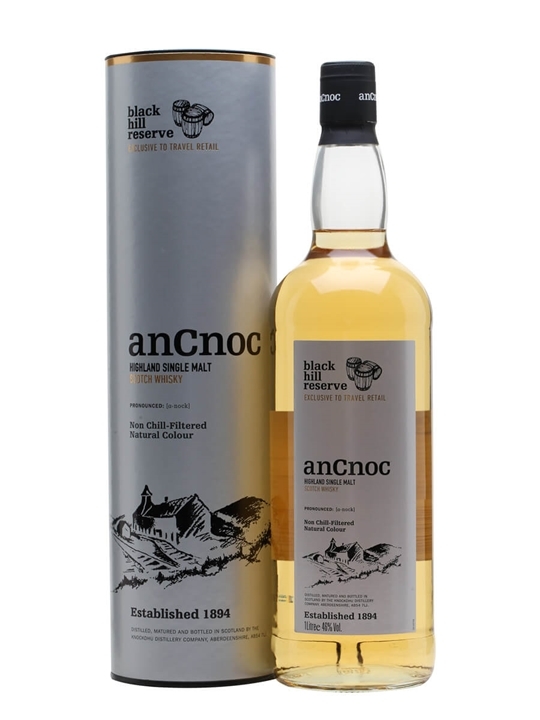 Summary: 70cl / 46% / Distillery Bottling – Produced at Knockdhu distillery in Aberdeenshire, this is AnCnoc's smokiest-ever whisky and a welcome addition to the core range for fans of their 'Peaty' series. 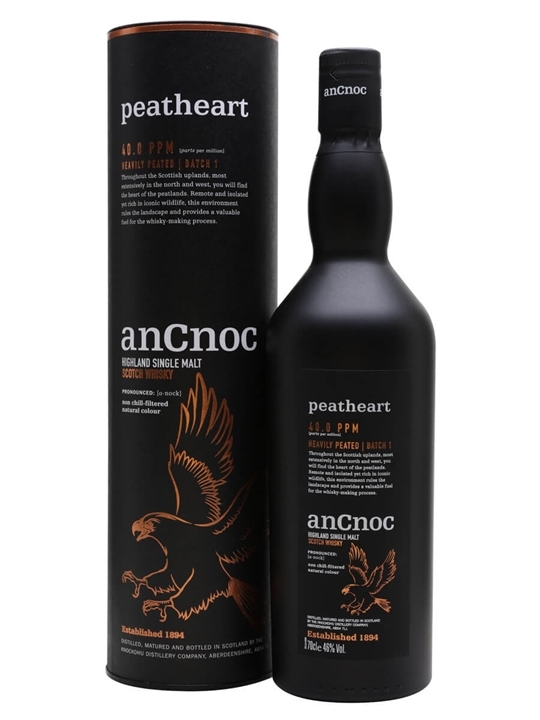 Peatheart is a single malt with intense smoke followed by orchard and citrus fruit notes. Summary: 100cl / 46% / Distillery Bottling – A travel retail exclusive from the Knockdhu Distillery. Knockdhu is Gaelic for Black Hill – the nickname for Knock Hill – the area that is the source of all the distillery's water. Black Hill Reserve has been matured solely in first fill ex-bourbon casks and has bright notes of fruit, coconut and fresh vanilla. 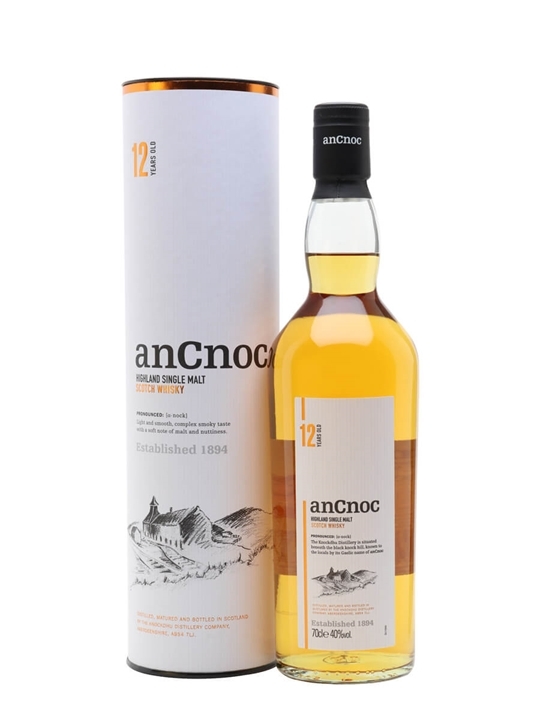 Summary: 70cl / 46% / Distillery Bottling – AnCnoc's range of peated whiskies is named after tools which are used to aid peat cutting. A rascan is a tool for breaking up turf to get to the peat underneath. At 11.1ppm, this is sweet, spicy and pleasantly smoky. Summary: 70cl / 46% / Distillery Bottling – The third (fourth if you include Travel Retail exclusives) bottling as part of the collaboration between Knockdhu distillery and Scottish designer/artist Peter Arkle. A vatting of Spanish ex-sherry butts and American ex-bourbon barrels, bottled non-chillfiltered with natural colour at 46%.